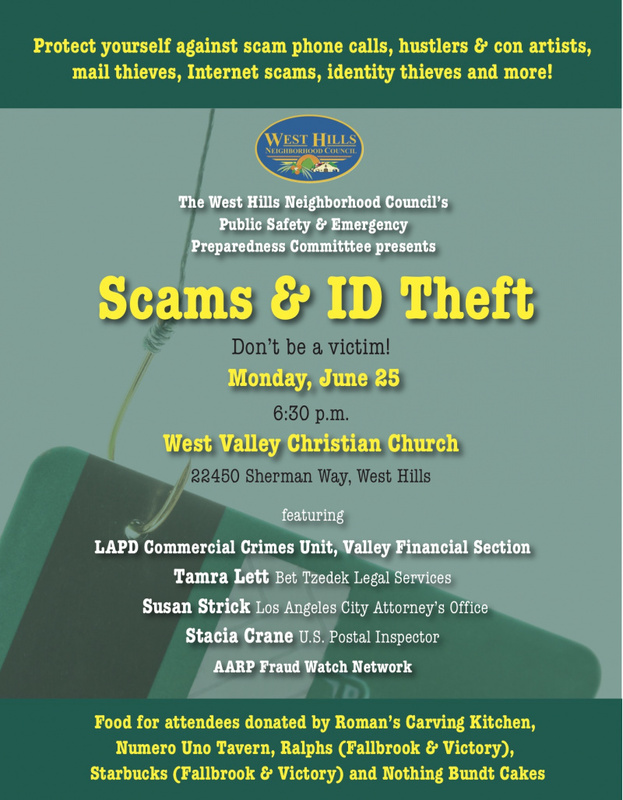 The public is invited to learn about “Scams and ID Theft” in a forum set for Monday, June 25, at 6:30 p.m. at West Valley Christian Church, 22450 Sherman Way in West Hills. Presented by the West Hills Neighborhood Council’s Public Safety and Emergency Preparedness Committee, the forum will feature United States Postal Inspector Stacia Crane, Susan Strick of the Los Angeles City Attorney’s Office, a representative of the Los Angeles Police Department’s Commercial Crimes Unit, Tamra Lett of Bet Tzedek Legal Services, and a representative of AARP’s Fraud Watch Network. “Residents of our area are being hit hard by identity thieves, Internet scammers, telephone scammers, hustlers and con artists,” said Bob Brostoff and Steve Kallen, co-chairs of the WHNC’S Public Safety and Emergency Preparedness Committee. Food and refreshments for attendees will be donated by Roman’s Carving Kitchen at Fallbrook Center, Numero Uno Tavern at Victory and Valley Circle, Ralphs Supermarket at Victory and Fallbrook, Starbucks at Victory and Fallbrook, and Nothing Bundt Cakes at Platt Village.